Whatever you think of Theresa May’s Chequers Plan, it did at least unite the Cabinet for 48 hours. On the plus side, it was at least a plan. 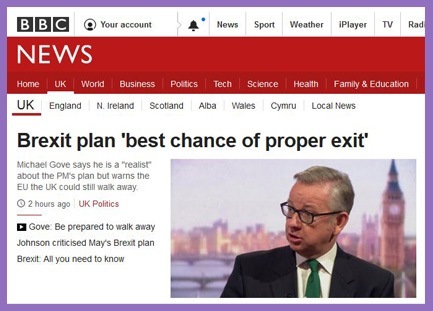 It may not have been perfect, as Michael Gove pointed out on the Andrew Marr Show, but it proposed a Brexit which includes repeal of the European Communities Act 1972, which means an end to ‘ever closer union’, so sovereignty will no longer be ‘pooled’. Parliamentary sovereignty is thereby ‘restored’. It was an opening bid in a fraught negotiation, which the EU would certainly reject in a number of cherry-picking (goods/services) regards, which would probably lead to ‘no deal’ and WTO rules. If there is a deal to be had, it would be better to judge Theresa May on her concessions, not her opening gambit. On the negative side, well, there’s a lot of give and buckets of fudge. A ‘common rulebook’ and ongoing harmonisation (for ‘frictionless’ trade) makes bilateral trade deals with the rest of the world rather difficult since deviation from EU regulatory standards wouldn’t be possible (unless Parliament determined to do so, and risked the ‘consequences’); and this means an ongoing role for the European Court of Justice (but only so far as Parliament permits). Some term this a ‘vassal’ relationship: the UK would be a ‘rule-taker’ not a ‘rule-maker’. The proposed ‘New Customs Partnership’ is not the Customs Union, but it is a binding customs bureaucracy by which the UK effectively becomes a tax collector for the EU. And free movement of persons becomes something called a ‘mobility framework’ which appears still to favour EU immigration over the rest of the world. For many, if not most Brexiteers, the negatives outweigh the positives: this is ‘Brexit in name only’ (BRINO); a ‘fake Brexit’ or ‘Brexit betrayal’. It is a dog’s breakfast kind of Brexit. Leaving the EU was always going to be incremental: it took us 40 years to become enmeshed in the EEC/EC/EU political morass and snarled by reams of bureaucracy. You can’t untangle that overnight, or even over a year of nights. A conservative approach would be to diverge gradually and organically, avoiding the unrest of revolution, and (whatever you think of it) the Chequers Plan was at least a seismic step toward that. Perhaps not as seismic as some would like, but when the parliamentary arithmetic isn’t in your favour, there is a need for a little political pragmatism. The main point (surely?) is that the European Communities Act 1972 is repealed: the UK is free from the Treaty of Rome (and subsequent amending treaties); ‘ever closer union’ is dead. Since sovereignty is no longer ‘pooled’, a future government would be free to build on the Chequers Plan and diverge (or converge) as it wished. And if it didn’t, the people would be free to vote for a party which pledged to do such things. Isn’t that the exercise of the very sovereignty by which we will have taken back control?